Novelist Dufresne (Deep in the Shade of Paradise, 2002, etc.) meanders through 18 stories, set mostly in Florida’s Broward County, offering a spot of charm but little by way of real satisfaction. The title story, the most substantial of the lot, is a rambling account of Hurricane Fritzy’s approach to the Florida coast as the narrator, his estranged girlfriend, Annick, and his undisciplined dog Spot remain among those who do not evacuate (“it’s futile to think what if? about your life, but I’ve been doing it since I was a kid”). Dufresne’s ruminating, associative, plot-resistant narrative manner is, at its best, casual and neighborly, but more frequently it’s just plain slow. About a third of the stories are too sketchy to bear up under scrutiny—two- to three-page bits that deliver little. The least appealing is the fragment “Breaking It Down for You,” with a man whining that he was “provoked” to explain why he killed his girlfriend’s two-year-old. “Talk Talk Talk,” weightier, spans the 30 years of the marriage of an unfaithful wife and the man who stays with her despite her affairs. As she lies dying, the husband thinks, “You don’t walk out on responsibility. You take heart.” The suspenseful “Based on a True Story,” about Curtis, who kills a couple of women who irritate him, is told primarily in list form: “7. Curtis’s wealthy and connected parents hire a costly and brilliant attorney from Shreveport to defend him,” for example, or “9. The charming, gifted and handsome attorney is struck by lightning and killed. (Truth is stranger than fiction).” This approach moves the action along quickly as, in chilling fashion, it illuminates a psychopathic killer driving an inebriated young woman home. 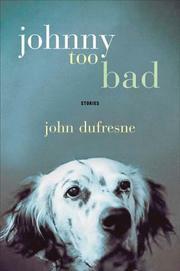 The two strongest stories—“Johnny Too Bad” and “Squeeze the Feeling” (Annick becomes pregnant, then loses the baby)—stand out for their sharply observed portrait of a man’s wistful connections to his carefree dog and to the independent woman in his life. Overall, a disappointing first collection.